Published Nov 18, 2014 by Peachpit Press. Part of the Learn by Video series. Adobe Photoshop Lightroom continues to grow in popularity, with Adobe now offering the software to photographers for only $9.99 a month. The video is being created by Adobe Certified Expert Rob Knight, a proven expert on the software, as well as first-rate photographer and presenter. 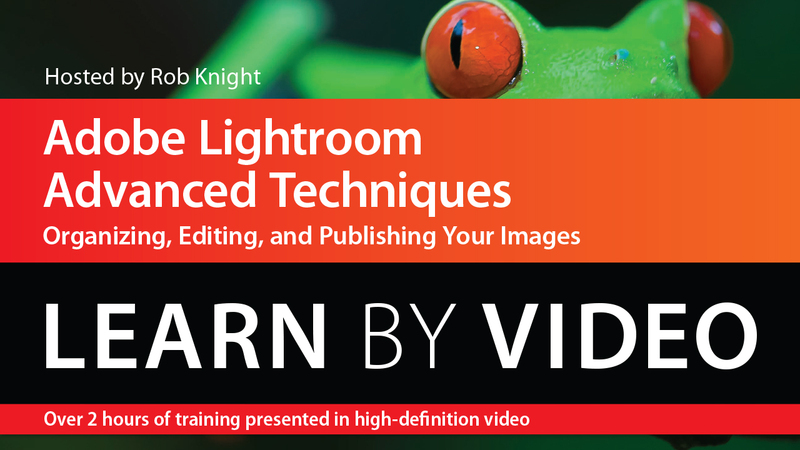 It will cover advanced techniques in Adobe Photoshop Lightroom, focusing on the Library, Develop, and Export Modules. The video is wrapped in a unique interface that allows you to jump to any topic and also bookmark individual sections for later review. The unique “Watch and Work” mode shrinks the video into a small window to allow you to work alongside in Lightroom as you view the video. Project files used in the lessons are included so you can practice what you’ve learned. At the end of every lesson, you can test your knowledge by taking interactive quizzes.